Universal Orlando Resort and Warner Bros. Entertainment released new concept renderings of the much-anticipated The Wizarding World of Harry Potter – Diagon Alley opening this summer at Universal Orlando Resort. Muggles will have the opportunity to ride the Hogwarts Express, travel to King’s Cross Station, and wander through Diagon Alley, experiencing the world of Harry Potter like never before. The Wizarding World of Harry Potter – Diagon Alley will be located at Universal Orlando’s Universal Studios while The Wizarding World of Harry Potter – Hogsmeade is situated at Islands of Adventure theme park. The Hogsmeade attraction opened in 2010 and features the Hogwarts castle, Harry Potter and the Forbidden Journey attraction, and the Hogsmeade village. 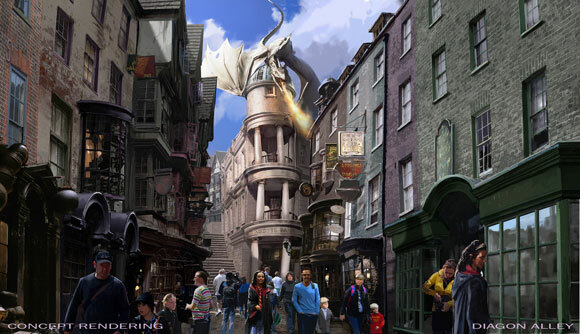 The Wizarding World of Harry Potter – Diagon Alley will include “new experiences based on the signature areas of London, Diagon Alley and Knockturn Alley.” Both the Hogsmeade and Diagon Alley parks were designed with the input of Stuart Craig and the Harry Potter films’ production team. · Board the Hogwarts Express and journey between London’s King’s Cross Station (located in Universal Studios Florida) and Hogsmeade Station (located in Universal’s Islands of Adventure). The journey will be filled with views of London and the British countryside – as well as a few surprises. Park-to-park admission is required. For more info, visit www.universalorlando.com/harrypotter. – HARRY POTTER, characters, names and related indicia are trademarks of and © Warner Bros. Entertainment Inc. Harry Potter Publishing Rights © JKR.